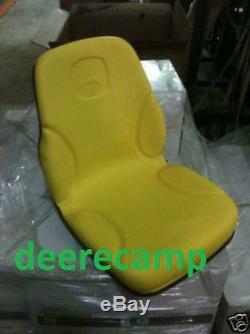 Brand new, unused, tractor seat, Replaces part number LVA12909 and LVA12330. This complete seat is ready to bolt on and has provisions to mount the SMV. Don't take a chance with a "should fit" seat. 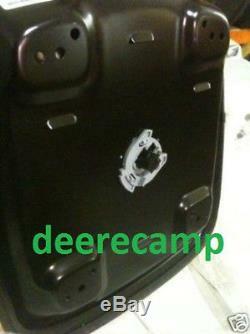 This is a simple bolt on installation and is guaranteed to fit John Deere Models 3120's, 3320's, 3520's, 3720's. 4120's, 4320's, 4520's, and 4720's. This seat is also guaranteed to fit the following tractors depending on the serial number: 4210 Hydrostat s/n 120936 and higher 4210 SyncShift s/n 128238 and higher 4310 Hydrostat s/n 132068 and higher 4310 PowrReverser s/n 135618 and higher 4310 SyncShift serial number 138137 and higher 4410 Hydrostat s/n 141401 and higher 4410 PowrReverser s/n 145400 and higher 4510 PowrReverser s/n 155830 and higher 4510 SyncShift s/n 154031 and higher 4610 Hydrostat s/n 160384 and higher 4610 PowrReverser s/n 165256 and higher 4610 SyncShift s/n 164005 and higher 4710 Hydrostat s/n 170885 and higher 4710 PowrReverser s/n 175739 and higher All my seats are guaranteed to fit the stated application. Thanks for looking and please check out my feedback and other auctions. 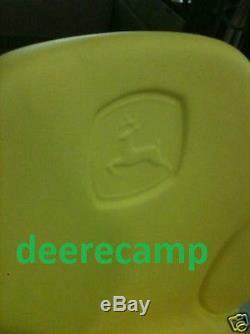 The item "New Seat for John Deere models 4210, 4310, 4410, 4510, 4610, 4710 tractors" is in sale since Saturday, January 8, 2011. This item is in the category "Home & Garden\Yard, Garden & Outdoor Living\Lawn Mowers\Lawn Mower Parts & Accessories". The seller is "sydenstricker-dutzow" and is located in Dutzow, Missouri.